Throughout its history the United States silver dollar has been a controversial coin. The early issues (1794-1803) were largely exported to Asia and the Caribbean as bullion coins, and their minting was suspended for more than thirty years. When regular production of silver dollars resumed in 1840, the lovely 1836-39 patterns by Christian Gobrecht were scrapped in favor of a type already in use for the half dollar and quarter dollar. Robert Hughes furnished a disappointing adaptation of Gobrecht's Seated Liberty, and this was paired with an update of the shield-breasted eagle first used in 1807. 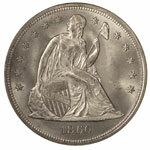 Only two subtypes exist for Seated Liberty silver dollars. The type without motto was coined through 1865, while the motto IN GOD WE TRUST was added beginning in 1866. 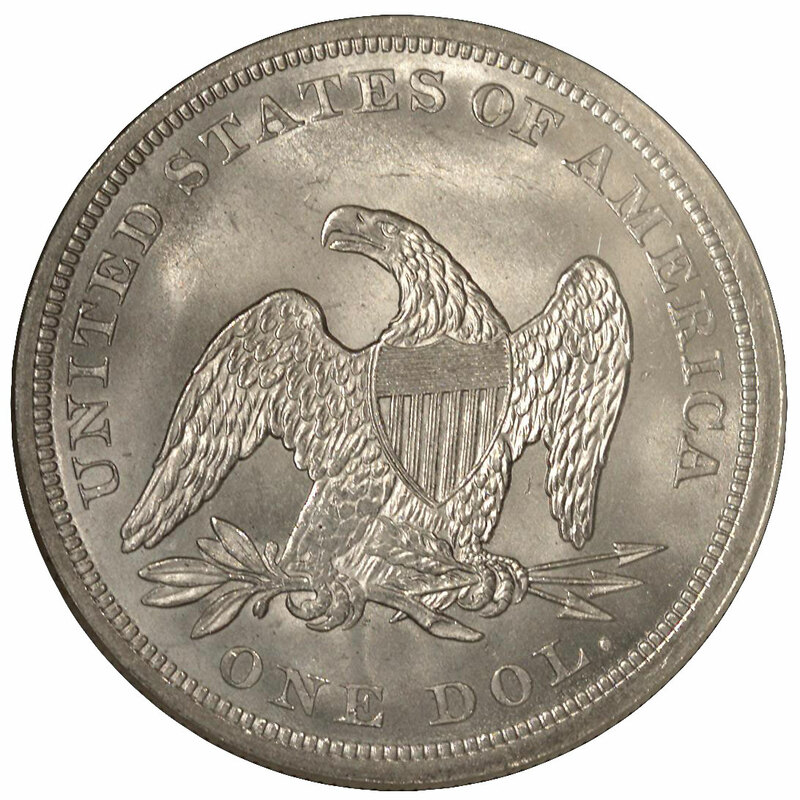 This type lasted until 1873, at which time coinage of the standard silver dollar was terminated in favor of a trade dollar having a higher intrinsic value. Only a few dates in this series are generally available in mint state. These include 1859-O, 1860-O, 1871 and 1872, and they were among the coins retrieved from U. S. Treasury vaults during the great silver dollar scramble of 1962-64. While these do provide a source of lustrous and unworn dollars, most of these coins are very heavily scuffed and nicked from a century of being moved around in bags. All other dates in this series are rare in mint state condition, though the 1843(P), 1846(P), 1847(P), 1860(P) and 1873(P) dollars are a little more available than the remaining issues. Because uncirculated Seated Liberty dollars are often quite heavily marked, many collectors find lightly worn pieces to be just as desirable. An About Uncirculated example with nice luster and clean surfaces is usually more attractive than the typical coin grading MS-60 through MS-62. While these are elusive for most dates, there are enough of both subtypes that a suitable example may be found. Since most dates in this series had small mintages, they are often seen with prooflike or satiny fields. These represent progressive stages in the life of a die before it acquires the frosty, roughened textured associated with much later strikes. 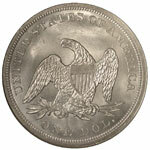 Frosty luster is less often seen on Seated Liberty dollars, aside from those few issues having high mintages. Also typical of this type is weakness of strike. 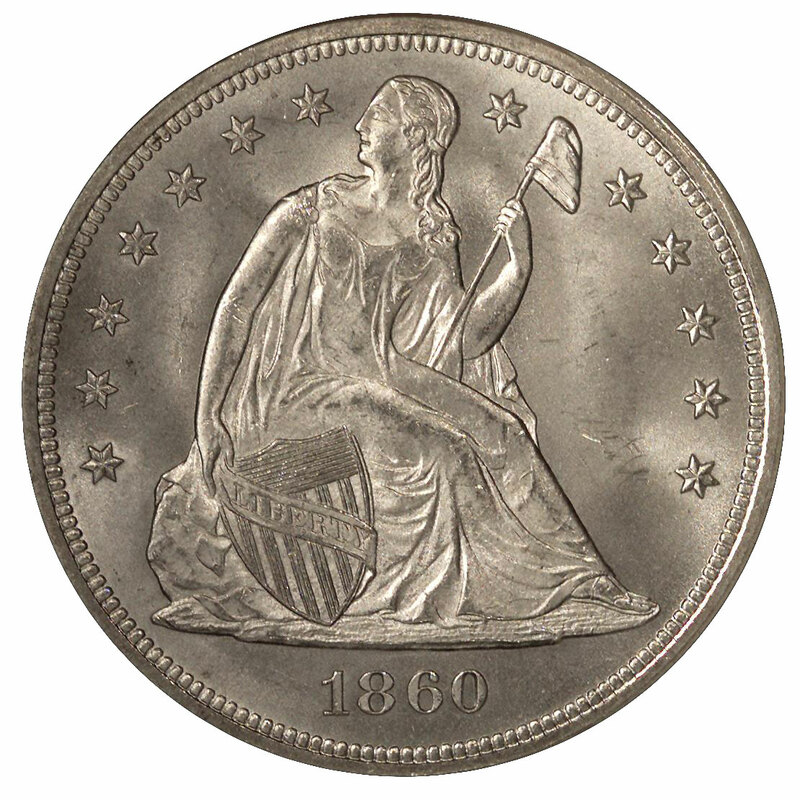 The areas most often found incomplete, even on mint state coins, are Liberty's head and foot, as well as the eagle's claws and the upper part of its right (viewer's left) wing. When seeking a type coin, you should pay particular attention to finding a sharp impression, since this will illustrate the design much more satisfactorily. The Official American Numismatic Association Grading Standards for United States Coins advises that, "Pieces dated 1870 through 1873 are from a distorted obverse hub with the word LIBERTY too exposed, resulting in part of the word's being worn off of Fine grade coins." I have to confess that I've never noticed this before, but it would account for the difficulty in grading these dates, particularly the rare Carson City Mint pieces. Speaking of circulated coins, I've found that examples of this coin type seem to wear less evenly than the smaller Seated Liberty coins. It's not unusual to find pieces where the obverse and reverse grades don't match. In some instances, heavily worn coins will have distinct borders in some places and have other areas where the border has blended entirely with the field. Obtaining an even strike on such a large coin was not an easy matter, and I believe this fact accounts for their irregular wear pattern. Another possibility is that such irregular wear resulted from use of these coins as pocket pieces rather than from actual circulation. Eye appeal is especially critical to grading these coins. The majority of surviving examples have been cleaned at one time or another, though the resulting harm will vary greatly from one coin to the next. Pieces that were lightly cleaned generations ago and have had time to naturally retone are still attractive and may be eligible for certification by the major grading services. Totally original coins, that is, ones which have never been cleaned at all, are precious and highly prized by experienced collectors.